My initial reaction to this was: Whoa. Wait a minute. WTF? 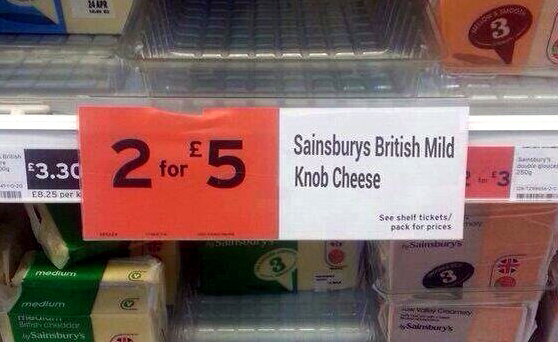 Sainsbury's, you just have to be kidding me. As if the possibility of buying horse meat balls wasn't enough to put you off these places, they now proudly present Knob Cheese. That's just... No. No. No. You simply can't market a product with a name like that. But actually, the 'product' is nowhere to be found on the Internet other than on Twitter and Facebook (thanks, John H) so I'm guessing it's a spoof. And, if you Google the term, you find... well, what you'd expect. The give away? The missing apostrophe in Sainsbury's. Poor research on the spoofer's part, I'm afraid. But the most disturbing thing about it, fake or otherwise?